Some people can rebuilt their car's engine and some of us wouldn’t know even how to replace a dead headlight bulb. For you go-getters out there, who like to go it alone without the middleman, good on ya and kudos for giving it a go… including trying to sell your home without an agent. However, here’s the reality. According to statistics from the National Association of Realtors (yeah, those guys), your chances of successfully selling your home via the For Sale by Owner (FSBO) process is a mere 10%. Allegedly, for those FSBO homes that do sell, they sell for less than agent-assisted sales, however, you will save on agent commissions which will offset some of that diffeence. 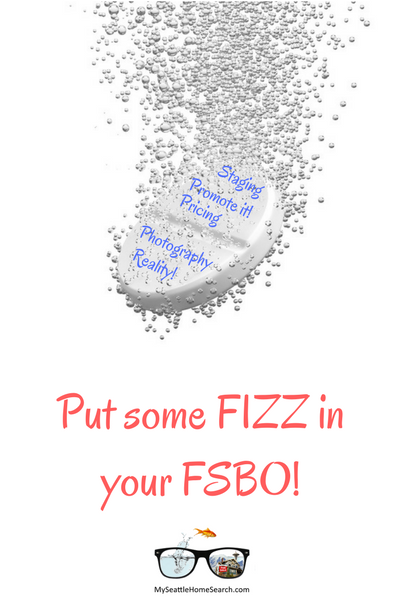 The odds are stacked against you and there are many reasons whys FSBOs fail to sell. The focus of this post is not to get you all riled up telling you why you would be better off listing your home with a Realtor. I’ll leave that up to the 10 agents who will call your every day while your home is on the market, each jostling to convince you why you should list your home with them. Prepare to become very popular and screen your calls. No, the focus of this post is to hopefully help you improve your odds of successfully going it alone and giving youself the opportunity to give us Realtors the proverbial middle finger. 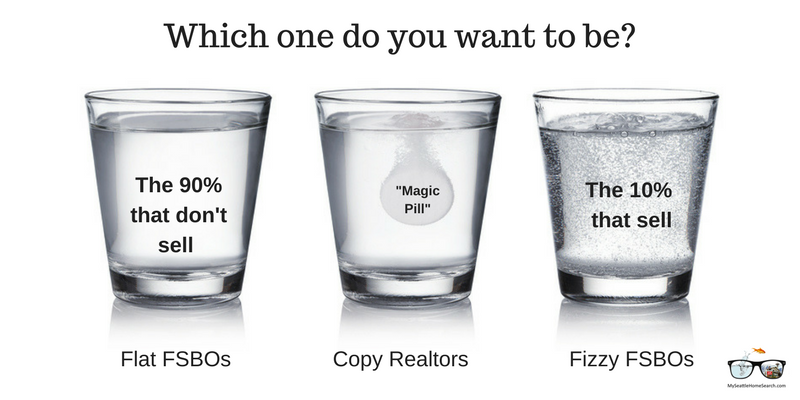 The vast majority of homes listed by agents do sell, while the vast majority of FSBOs don’t. So what’s the difference? Well, obviously, Realtors are doing something right and you just need to learn how to copy them. Selling a home is not rocket science but a least try and do the basics properly so you improve the chances that your rocket will take off if you do decide to fly solo! Don’t be half-assed about it. Don’t be too stingy to spend some money on getting your home ready or be too proud to accept some solid advice. The information here should help you generate some offers on your home. It's not going to cover every step of the whole FSBO process for you, just the activities that will improve the chances of generating a good offer on the property. Without an offer, you and your home are going nowhere. It's critical to get the first part of the process right. You too can be a real estate agent! Do what they do. I realize that the thought of this might your feel a little dirty, after all we agents are just above second hand car salesmen in public opinion polls. But hey, we're proudly about lawyers! As much as we all love our own homes, no home is perfect. It’s easy to be biased and think you live in the best house on the street (I know I do!). But remember, your home will be just another home, competing with all the other homes once it hits the market. Your home becomes a product and perceiving your home as such will help you get your product sitting on the top shelf of the isle, not languishing on the bottom shelf gathering dust. First and foremost, YOU HAVE GOT TO GET THE LISTING PRICE CORRECT! Get this wrong and you are probably screwed. The urge will be to list the home for more than it’s actually worth. Hey, you’re only human, plus you have the best damn home on the street, right? However, if you list too high, you will sit on the market and if you list too low you will most definitely sell but you will probably leave a bunch of money on the table. So how are you going to determine the market value of your home? And before you utter the “Z” word, please don’t! The infamous Zesstimate is strictly for amusement purposes only and is to be taken with a big pinch of salt. Did you hear that Zillow CEO’s own home sold for a lot less than its Zesstimate? I know, ouch! So how do you get an accurate evaluation? Just pay a Realtor or appraiser to do one for you. A real estate agent might even do it free, hoping you will call them if your home fails to sell. An appraiser might charge you $500 but it's worth every penny. If you skimp on setting the price correctly, then, good luck to you, you’re going need it! Prepare you home properly: remember your home is now a product and you need to make that product as appealing as possible. Start from the outside and work your way in. Start with the all-important curb appeal. Your home has to entice buyers to venture from the curb or the comfort of their cars and make them want to see the inside of your home. First impressions are critical. Now you need to focus on the inside of the home: Declutter and clean until it's Q-tip clean and your fingers are bleeding (or just pay someone) and touch up that paintwork. There are lot of elbow grease or low cost things you can do that will make a huge difference and add some pizzazz to your home. Also, take care of any needed repairs before you list the home…. time for you to make your every-10-year visit to the attic and the dreaded crawl space areas. Don’t cross your fingers and hope a buyer won’t find your home's issues, because they will. Good Realtors are not afraid to point out to seller clients stuff that needs to be addressed before the home is listed for sale, even if it risks slightly insulting the home owner (trust me, it’s for your own good). However, when going the FSBO route, you’re on your own and nobody is going to tell you what “issues” need to be addressed. Those little unique aspects of your home that are not helping your cause such as those horrendous paint colors and funky dog (and human) odors. So what do you do? Ask your friends for their honest opinions on what they’re not particularly keen on and ask for suggestions. Ply them with truth serum (aka alcohol) if needed for more reliable feedback. Try and put yourself in the buyer’s shoes and look at your home with buyer’s eyes. It’s easy to critique other people’s homes but not your own. A (good) photo is worth a thousand dollars: Believe it or not, this is an opportunity for you to outshine a sizeable percentage of slacker real estate agents who stick homes on the market with terrible listing photos. Good photos are crucial to making your home looking great online and attracting buyer eye balls. You home needs to have great web-appeal. Even if you are half handy with a camera, it is still a really wise move to spend $200 to $300 on a professional photographer, more specifically a real estate photographer who knows how to make your home pop in pictures. Don’t be cheap and skimp on this. Great photos are THE most bang for your buck. Your cell phone is for making calls, not for taking listing photos! So now, your home is looking better than it has in years, priced properly and those photos have you reconsidering whether you really want to sell after all. You stick a for-sale sign from Home Depot in the front yard, add a few of those directional signs on the street corners near your home and await the masses of humanity and ensuing adoration. And then there was silence……..
You have to PROMOTE your home. A whopping 95% of buyers look for homes online. They don't rely on randomly stumbling across homes via for-sale signs. Bring your home to the masses and pay someone to post it on your local Multiple Listing Service (MLS). There are plenty of companies out there that will post your home online including those for a few hundred bucks. Telling your friends you are selling and posting it on Facebook etc is fine but you have get it on the MLS where thousands of potential buyers are eagerly waiting for new listings. So, that's all there is to it? Well, not exactly. As I mentoned above, following these steps will help improve your chances of getting a good offer on your home. However, that's just part of the process. You still have learn how to neogiate offers, how to handle inspection reports, how to do the contract paperwork and coordiante closing etc. So even if you are one of those people who can rebuild a car engine and are an enthusaitic self-learner, remember, selling a home, although not rocket science, is not as easy as it looks. Make sure to add some pazazz and fizz to your home and hopefull you will get to pop a bottle of bubbly.